You won't find anything better for Northwest experience- nature surrounded, peaceful Pacific Northwest. Close to everything yet completely private. THE COMPASS ROSE HOUSE is one of three separate homes on over 25 acres, all with Olympic Mountain views. These secluded rentals offer you a haven to explore all the diversity the Olympic Peninsula has to offer. Easy access to two towns and the Olympic National Park. Serenity awaits you. Roam our lush lupine covered meadows, languish by the ponds, see Bald Eagles and Blue Heron and access The Olympic National Park, just minutes away. The THE COMPASS ROSE HOUSE is carefully handcrafted and meticulously detailed. This beautiful home and hot tub have commanding views of the Olympic Mountains. This tasteful home has an open plan with vaulted ceilings and is surrounded by lush meadows. It feels very roomy and open to nature while also being cozy. This charming cedar home is ideal for couples, but can accommodate up to 8. The master bedroom looks onto the Lupine Pond, a 1/2 acre pond that reflects the mountain views and attracts a large variety of birds. An upstairs room, open to the lower level, and accessed by a 'ship's ladder', has a view of the pond and the lovely private, surrounding meadows. Enjoy cooking in the deluxe kitchen, well equipped with all the cooking amenities, staples and spices and a gas stove, oven, large refrigerator and island. The bathroom with walk-in large tiled shower comes equipped with washer and dryer. There is wood stove with a glass door so you can watch the fire and curl up with a good book, or simply enjoy the comfort of the radiant heated floors. The sliding glass doors open to a large deck where you can take in the awesome Olympic Mountains and the acres of natural, unspoiled meadows. Have a barbecue, watch the Bald Eagles as they dive for fish in the pond. Gaze at the stars at night, roast marshmallows around the fire pit, roam the meadows or take an adventure into Olympic National Park. THE COMPASS ROSE HOUSE can also be rented for groups along with our other two cabins. See our other VRBO listings. Ten minutes away are Sequim and Port Angeles, the world’s longest sand spit, the ferry to Victoria, B.C., Canada and the entrance to Olympic National Park, where the road to Hurricane Ridge takes you to a stunning view of active glaciers in the Olympic Mountains. You can venture into the moss covered rain forest, enjoy a pristine glacier carved lake, hike hundreds of miles of wilderness trails with crystal clear rivers and majestic waterfalls, be awed by the sandy rugged beaches, and soak in natural hot springs. Whether you are a nature lover who likes to kayak, surf, fish, spot birds, watch whales, bike or hike the trails, or someone who is search of a perfect quiet natural setting, here you will find your heart’s desire. 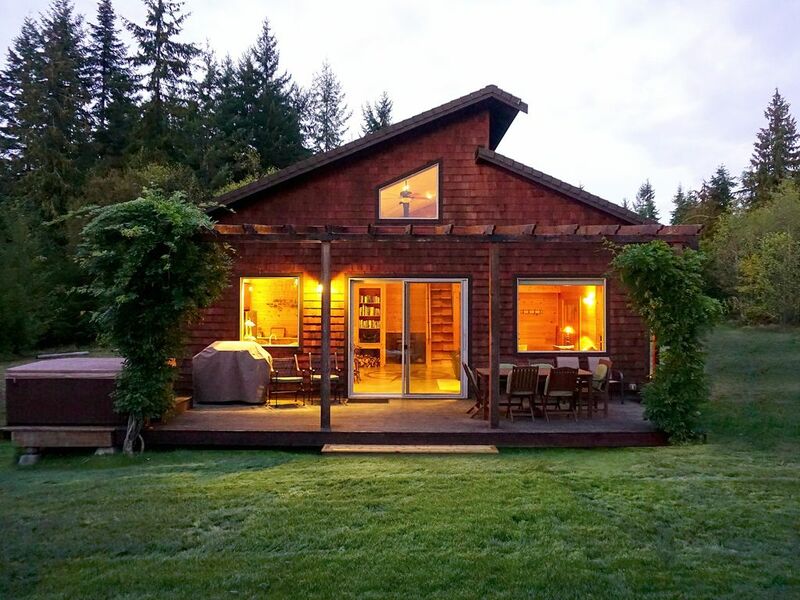 Keywords: Luxury Cabin, fine quality, private home, vacation rental, vacation rental home, Olympic National Park, Olympic Peninsula, natural environment, mountain views. Private, secluded, country environment. Martin and Suzann are owners and full-time managers of Olympic View Cabins. They are close by so are available whenever you might need. Their son designed and built the cedar Compass Rose House in 2010. We had a vision for over 30 years of a family compound where we could live and share a beautiful natural environment with our son and daughter. We traveled the Pacific Rim, New Zealand and Canada in search of a place. When we found this place 14 years ago it felt like we had found our dream. The Olympic Peninsula provides remarkable natural beauty of almost every sort. We climb mountains and get into areas with pristine glaciers and lakes and see bear and goats and deer, and a huge variety of birds. We love to find waterfalls that few people have found and explore the rainforest mysteries summer and winter. Our children surf the waves as we explore the beaches which have unusual pinnacles and formations, and we collect driftwood and bask on the white sand. We take our family picnicking on the beautiful clear rivers where they often catch Steelhead or Salmon. Skiing and snowboarding and several winter sports are a big attraction. And always, we make sure visitors get into the exceptional Olympic National Park. We take great pride in the home we offer to you with meticulous detail. Our son designed his Compass Rose House and we all built it together. Some refer to it as 'elegant camping' since you feel like you are almost out of doors with the openess the home has to all the surroundings. You have all the luxuries for truly comfortable living; excellent beds and linen and great cooking facilities--even the best of organic local herbs. Our specialty in life has been to enjoy and appreciate nature and to help others have that passion too. And that is witnessed in our lovely property and the beautiful homes we have blended with the natural environment. For those who want privacy, we provide it. For those who want a serene and restorative Northwest experience, we provide that. Our homes are surrounded by meadows and a pond filled with fish, with majestic trees lining the edges and wildflowers. We have tried to make nature available and enjoyable out of every window and from every deck. Our hot tubs are outside so you can view the stars. You can see the Olympic Mountains in all their array from nearly every window. We want to touch people, to leave a lasting memory of enjoyment and rejuvenation, to have an infectious experience that compels them to want to pass on the importance of our natural resources to everyone. Excellent, custom designed, large, modern bathroom with walk-in shower and washer and dryer. Spectacular panoramic view of the Olympic Mountains from nearly every window. Our 1/2 acre Lupine Pond is where you can fly fish or fish for Blue Gill and Bass. We even provide poles. Just steps away. We have another small pond that is in the distant view. no need for air conditioning since the average summer temperature is 72 degrees F, 21 degrees C.
Fine linens and plush towels, good quilts and plenty of pillows. glass door to view the fire, plenty of wood provided. Radiant floors throughout the home for heat. Hard to describe the outstanding views out of every window and the open high ceiling that makes it feel so spacious and open. Huge array of spices and herbs, dip seasonings, flour, sugar, oils, balsamic vinegar, regular vinegar and so much more. Guests say we haven't forgotten anything. Cuisinart processor, blender, coffee pot plus French press, salad spinner, garlic press, quality dishware and serving ware-everything you might need. Summertime guests love the outside table on the deck that seats 8. Indoor bar with 6 seats. A good selection of books includes Northwest fiction and non-fiction, hiking guides and more about the area. Good outdoor chairs and table. A separate fire-pit area has log seats. Only one step up to enter.We provide a ramp with pre-arrangement. Outside under the stars and on the deck. Exclusive use for the Compass Rose House only. Olympic National Forest is a short hike away and you can drive up the road and get into a remote part of Olympic National Park where you can have views of glaciers and stunning wilderness. Fishing poles are provided for fishing in Lupine Pond. The Compass Rose House is private and separated from the other rentals by acres of flower covered meadows. Port Angeles airport pick-up and delivery service with pre-arrangement. The Compass Rose House was a perfect home base for exploring the Olympic Penninsula. Lake Crescent, Hurricane Ridge, the dungeoness spit and the Port Angeles/Victoria ferry terminal are all within very easy driving distance. The home has breathtaking views of the Olympics, which you can enjoy from inside the home with its large windows and spacious great room, or from its deck, hot tub or fire pit area. The owners are delightful to work with and the home is exceptionally well maintained. Put this place on your shortlist! At least, I’m pretty sure it was heaven as I have never seen so my stars in my whole life. The Compass Rose Cottage is phenomenal. There are no words that can do it justice. From the moment you pull up to the cutest cottage in the trees you’ve ever seen, to walking in the door and being taken back by how stunning the inside is, it feels like home. The home is VERY clean and it is obvious how much love and care the incredibly sweet owners put into it. It’s perfect in every way, as are the delightful owners! For being so close to the 101 (between Sequim and Port Angeles), it feels like you’re deep in the forest... with a grocery store ten minutes away. The frogs sang their lullabies at night and the fire pit makes for great stargazing. We cannot wait to come “home” again to the Compass Rose. You’ll be glad you did, too. This cottage is everything it’s advertised to be and more. The setting is magnificent, it’s close to great hikes and nature walks And the inside space is cozy and beautiful. We cooked each night and the kitchen was well equipped. This place is perfect!! This is a lovely property, very quiet and relaxing. Nearby attractions include the Olympic National Park, Olympic Discovery Trail, Elwa River, and Hurricane Ridge. There are lots of things to do or a great place to do nothing and unwind. I couldn’t have imagined better set of circumstances that occured during our stay. From the weather to the cookies Suzann made us twice 😊� , everything was perfect. Such wonderful accommodations and gracious hosts. The surroundings were sublime as was the cabin. We can’t wait to return in the summer time! We put so much love and care into our three homes and it is rewarding to learn that our guests are so appreciative and satisfied. Easy access to Olympic National Park, worlds longest sand spit, rain forest, hot springs, whale watching, ferry to Victoria, B.C. Canada, Indian reservations, 7 Cedars Casino, museums, great beaches and all the amenities of the Olympic Peninsula. We are 4 miles from a Multiplex Cinema. A $95 turnover fee is charged on all homes to offset the cost of spa maintenance, fresh linens, firewood, etc. Please sign and return the rental agreement prior to arrival.